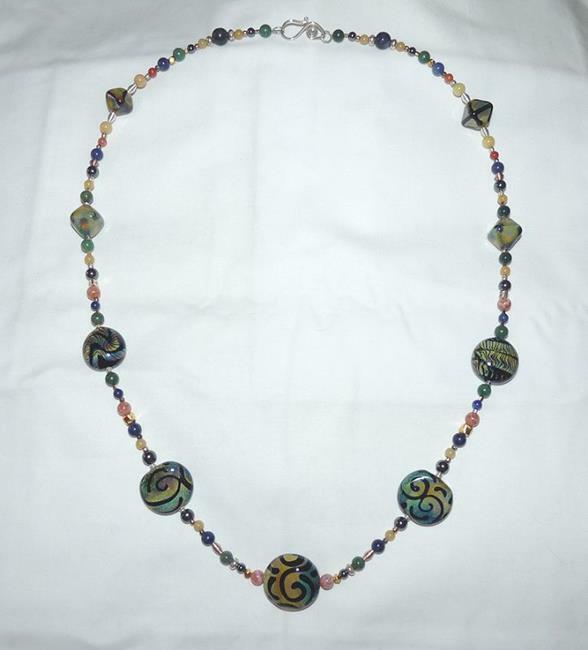 This .999 Fine Thai Karen Hill Tribe silver necklace has been specially crafted around the stunning lampwork glass beads created by Alexandra Spinglaschell of By The Sea Glass Art of Santa Cruz, CA. I am a rabid fan of Alex's beads (especially since the proceeds she derives from her sales fund a privately run cat rescue organization!) and absolutely adore working with them! Sometimes I'll have to buy several of her orphan sets to get exactly the right combination of beads but when they work, BOY do they EVER work! I just LOVE this set - beautiful raku with swirls of jet black and some stripes thrown in for good measure are accented by natural yellow jade, hematite and varying colors of natural jasper to give this piece a really chunky, unified yet clean and simple look. The necklace measures just over 20" long and is crafted of only .999 fine silver - all the links, jump rings and clasp were crafted by me and I guarantee that there is absolutely no nickel in this item to touch off any pesky allergies! This piece is available in my Etsy store.